July 11, 2012 (Addis Ababa, Ethiopia) – Ethiopian Airlines (Ethiopian) and FlightPath International (FPI) are excited to report impressive success in the implementation and performance of the International Civil Aviation Organization (ICAO) standard Multi-Crew Pilot License (MPL) program FPI designed for Ethiopian Airlines. The first stream of 27 Ethiopian based MPL students has progressed to Phase 2 with an impressive 100% pass rate. Started in October 2011, this is the first MPL program to be delivered on the continent of Africa. The second stream of 22 students has now started Phase 1 and at this point displays the same 100% pass rate. The Ethiopian/FP MPL training program integrates the knowledge and skill development of flight training using various training media combined with enhanced Crew Resource Management, Threat and Error Management, and airline specific procedures. A true competency-based program, the Ethiopian/FPI MPL program has an ongoing evaluation process to ensure training effectiveness and relevance to line operations. 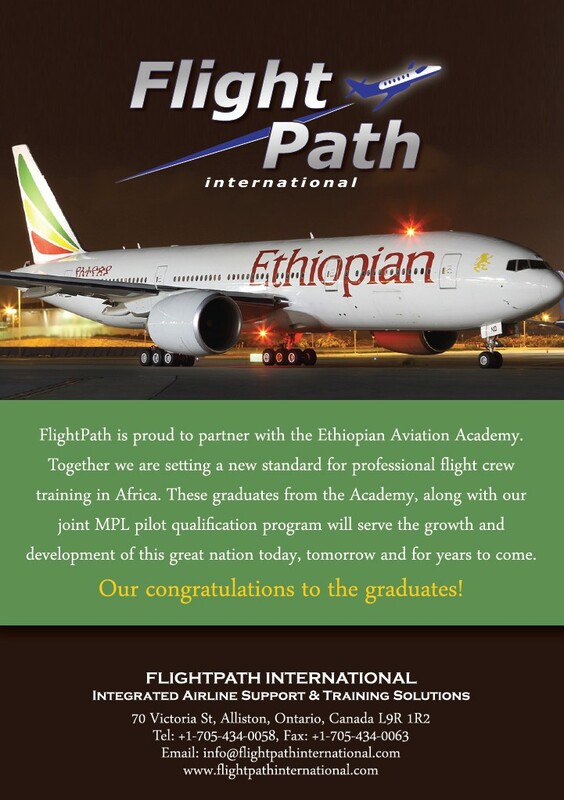 Ethiopian Airlines and FPI firmly believe that the MPL represents a major safety-centered upgrade to airline training worldwide and will jointly continue to promote this internationally-accepted program. Ethiopian Airlines (Ethiopian) is the flag carrier of Ethiopia. During the past sixty five plus years, Ethiopian has become one of the continent’s leading carriers, unrivalled in Africa for efficiency and operational success. The airline provides services to 66 International and 17 Domestic destinations with its fleet of 48 aircraft ranging from B747, B777, B767/757, B737 and Q400. This fleet will be expanded by an additional 43 aircraft to include the B787, A350 and Q400 Aircraft. FlightPath International is recognized as a firm specializing in Airline Aircraft training for Flight, Cabin and Maintenance personnel providing full service Airline Integrated Operational Support services. As an Authorized Bombardier Training Provider, FlightPath currently supplies services worldwide through a team of professional instructors and operational support personnel.